IOTA ia a distributed ledger technology (DLT) developed by the IOTA Foundation. Its based on a new DLT, the Tangle, which seeks to overcome the inefficiencies of current blockchain designs and introduces a new way of reaching consensus within a decentralized peer-to-peer system. The ultimate goal for the IOTA project is it to achieve mainstream adoption of the IOTA protocol and establish IOTA as the main currency to be used on machines. The platform’s vision is to enable all connected devices through verification of truth and transactional settlements which incentivize devices to make available its properties and data in real time. The number of connected devices that will be in use is estimated to reach 75 billion by 2025. The IOTA Foundation was established in Germany as a formal, non-profit organization on November 3, 2017 by Dominik Schiener and David Sønstebø, is the non-profit, open-source driven organization behind the IOTA distributed ledger technology (DLT) and other related technologies. IOTA held a crowdsale at the end of 2015 to help fund its development, raising a little over $500 thousand worth of Bitcoin and other cryptocurrencies. The entire token supply was distributed pro-rata to the crowdsale participants on the genesis transaction, and it’s never subject to change. The IOTA Founders then asked the initial IOTA token holders to donate a portion of their holdings back, receiving roughly 5% of the total IOTA token supply to endow the establishment of the IOTA Foundation. The IOTA Foundation pursues four main goals - to research and secure the foundational protocol layer, develop production-ready software for the community, partners and ecosystem, educate and promote technologies and use cases for new generations and standardize and ensure the maturity and widespread adoption of the Economy of Things. Headquartered in Berlin, Germany, the IOTA Foundation is a global organization, which operates in more than 10 countries including Israel, Brazil, Norway, United Kingdom, USA, Taiwan and Singapore. IOTA’s distributed ledger is a stream of individual transactions entangled together. It does not consist of transactions grouped into blocks as is the case with the blockchain. In order to participate in this network, a participant simply needs to perform a small amount of computational work that verifies two previous transactions. Rather than creating a hierarchy of roles and responsibilities in the network, every actor has the same incentives and rewards. According to IOTA’s official website, in order to make a transaction in the Tangle, two previous transactions must be validated with a reward. With this 'pay-it-forward' system of validations, there is no need to offer financial rewards. It is possible to securely store information within Tangle transactions, or even spread larger amounts of information across multiple bundled or linked transactions. This structure also enables high scalability of transactions. The more activity in ‘the Tangle’, the faster transactions can be confirmed. The first transaction in the Tangle is referred to as the genesis. All the IOTA tokens were created in the genesis, and no new ones will ever be created. All transactions in the tangle approve the genesis directly or indirectly. Because there are no miners in the Tangle, there are no transaction fees. The value sent is always equal to the value received. This enables feeless micro and even nano-payments which the emerging machine-to-machine sharing economy will require to operate at scale. In IOTA, every participant in the network making a transaction also actively participates in the consensus. Unlike the blockchain where miners and users of the system have diametrically opposed interests, with miners wanting slower transaction confirmation times and higher fees, and users wanting exactly the opposite, in the Tangle the incentives of all participants are perfectly aligned. The IOTA token (symbol MIOTA) is the currency used to transact on IOTA’s distributed ledger. 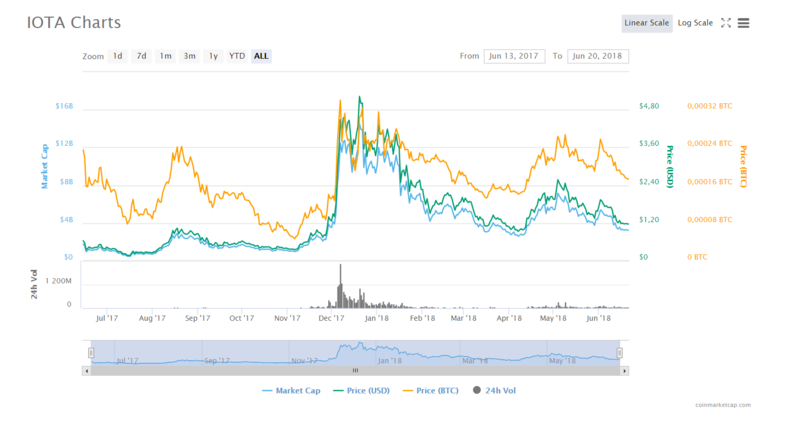 Price tracker CoinMarktCap.com lists IOTA as the 9th largest cryptocurrency with a total market cap of over $3.2 billion and a daily trading volume of $65 million. The price of IOTA is currently equal to $1.16. The token was launched in June 2017 with its total supply of approximately 2.78 quadrillion IOTA (2.78 PetaIOTA) made available from the beginning. No additional IOTA will ever be created. Until IOTA adoption becomes more widespread, 1 MegaIOTA (MIOTA) is the currently accepted base unit. IOTA tokens are freely traded on major digital currency exchanges, which include Binance, Bitfinex, Coinone, OKEx, Exrates, Huobi, Ovis, Gate.io, HitBTC, CoinFalcon and Cobinhood. On world’s largest cryptocurrency exchange Binance IOTA can be traded for Bitcoin, Ethereum and Tether. To buy IOTA, one will first need to deposit Ethereum or Bitcoin onto the account. Once the deposit has been completed, it’s necessary to click the “Exchange” button in the menu to trade the deposited cryptocurrency for IOTA. 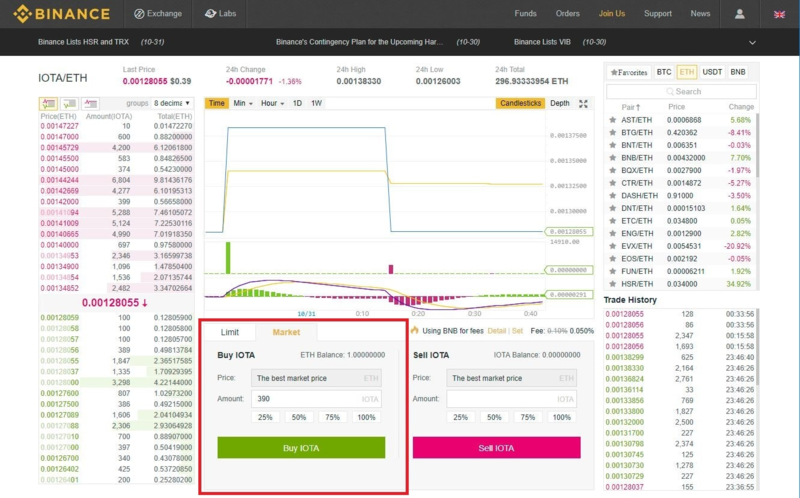 It’s then necessary to place a ‘Buy IOTA’ order using either a limit or market order. Binancecharges a .1% fee for trades. When placing a market order, the user can choose the percentage of the Ethereum (or Bitcoin) balance he wishes to use to buy IOTA. The market order will then purchase the maximum amount of IOTA available for the Bitcoin or Ethereum the user has chosen to spend. It will purchase the cheapest available IOTA until it has filled this amount. Once the order has filled, it will be shown in the available IOTA balance. The IOTA can then be withdrawn from Binance to a wallet. There is currently a limited number of IOTA wallets available . 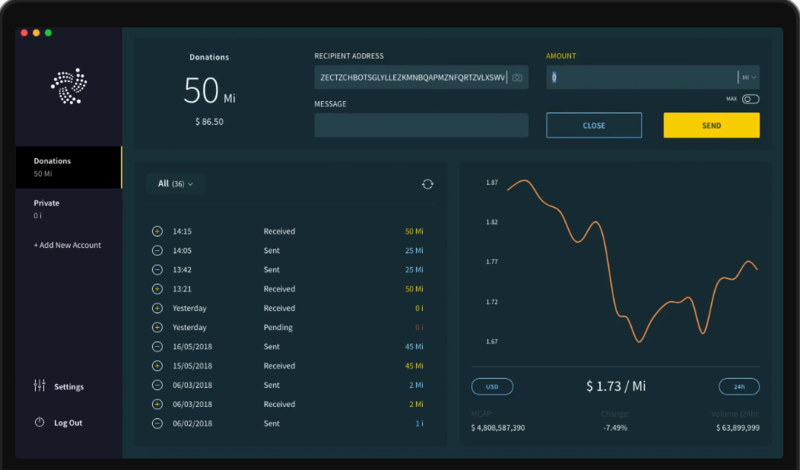 The best option would be using the official IOTA GUI Wallet Client to hold the coins out of exchanges. The Client makes it easy to set up quickly on all major operating systems. The latest client can be downloaded from Github. It’s simply necessary to choose the right executable for the respective operating system. The more user-friendly Trinity wallet is currently on beta release. According to Trinity’s official website, it is “designed to make transactions as simple and convenient as possible.” It offers a variety of features, from easy-to-use QR code support, to under-the-hood details like address reuse prevention. The main focus of IOTA is to enable the emerging Internet of Things, but beyond this IOTA plans to be the transaction settlement and data integrity layer for the Internet of Everything. This includes smart cities, smart grids, infrastructure, supply chain, financial services, peer-to-peer payments, insurance, and much more. On April 18, ElaadNL released the first charging station in the world where charging and paying can be done with IOTA, in a machine-to-machine way. 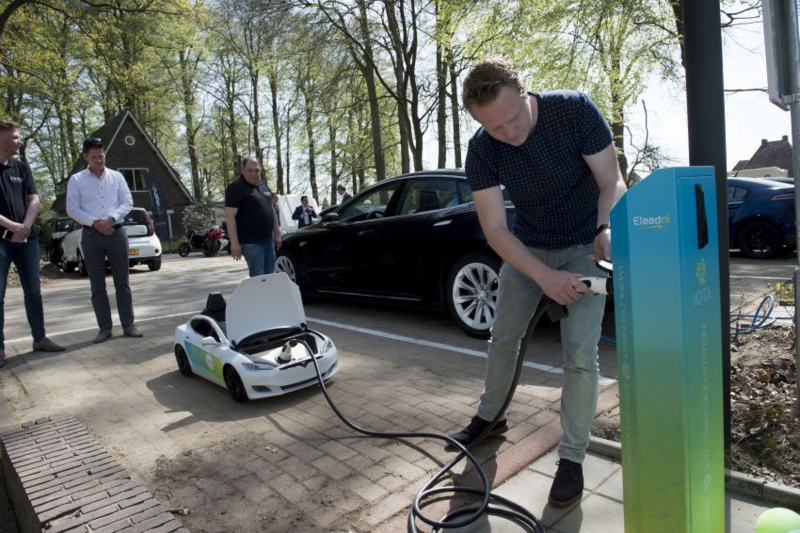 The charger is part of the new ElaadNL test site and contains all types of charging stations that are used in the public area in the Netherlands. This includes a fast charger, a charging island, a battery, two charging lanterns and the IOTA charger. Next year Volkswagen is expected to release first product that use IOTA’s Tangle. When announcing the project, Volkswagen’s Chief Digital Officer (CDO), Johann Jungwirth, said that the company was considering using Tangle for feeless transactions as well as to autonomously set prices based on levels of demand. The United Nations Office for Project Services (UNOPS) and IOTA have partnered to explore how IOTA’s innovative technology can increase the efficiency of UNOPS operations. IOTA’s distributed ledger can provide a greater level of efficiency in the management and tracking of UN documents, supply chains and transactional payments in real-time, with access available to both UNOPS and its partners. A new digital ID card that uses IOTA’s proprietary distributed ledger technology Tangle will launch this year in Taiwan’s capital city, Taipei. The ID card is designed to create a new level of security and help prevent identity theft.